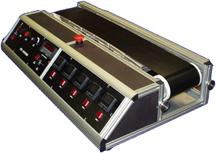 Our STI Phoenix Miniature Reflow-Curing Oven Five Heat Zones and One Cool Zonesfor a total of 6 zones. Temperature range Ambient +5 Deg C to 380 Deg C. TheHeat Zones have Digital PID Temperature Controllers with an Alarm Cutout Band,programmable to fit your requirements. Variable constants Belt Speed. FingerSafe Hood for the Two Heat Zones. Our Conductive Bottom Side heat allowsfor outgassing of Solders and epoxies without skinning effect. This is a Table TopOven 36 inches Long x 24 inches Deep and 12 inches High.